Yesterday Scendix Software, publishers of Pamela and PamFax, launched a new tool for monitoring Skype activity across a business. A designated administrator can install the small application client across user PC’s on a network; managers can view a portal-based dashboard and customized reports to view chat, voice and video conversation event activity. Think of PamLytics as logging the Skype equivalent of Call Detail Records. Time of conversation, length of a conversation, participants in a conversation, changes in Skype status and more are logged and reported using PamLytics. This is event logging; no conversation content is captured. To deliver a solution which can track and report this information, PamLytics uses the Skype Desktop API to enrich a company’s use of Skype by its employees. PamLytics will track all transactional activities of designated Skype users as they make voice and video calls, change their Skype status and build text chat sessions. The information collected is solely transactional – who is conversing, length of calls, etc., most importantly no content is stored. The administrator can monitor and examine the data from a web based portal page. Available are lists and charts which can be customized at will. There are also options to export data and drill down to individual users. Administrators can not only generate widgets for a customized dashboard but also create reports, with filters if appropriate, based on, say, business teams (sale, support, etc.) and determine what information is important for contributing to management decisions. All data is encrypted for transmission to a secure PamLytics server and accessible via a web portal. PamLytics subscriptions are based on number of users for one, three and 12-month periods. A free 30-day trial for up to 5 users is available. 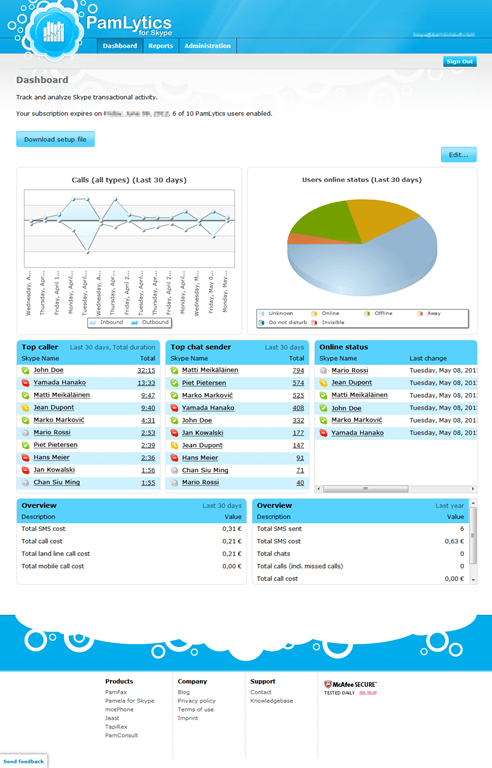 PamLytics offers a reporting and analysis complement to Skype Manager which allows an administrator to create business Skype accounts, delegate Skype credit, assign features and manage access to Group Video Calling. It’s also a complement to Pamela which provides not only call recording but also archiving and recall of chat sessions as well as many other utilities to customize and enhance the individual Skype user experience. Bottom line: Skype has become a key communications platform for many small businesses with fewer than, say, 50 employees, especially when they are dispersed worldwide. The real question here is whether PamLytics can deliver information that contributes to management decisions with respect to building a business team and customer relationships. The 30-day, 5-user trial provides a window for gathering a sampling of usage data and how it can contribute to management decisions. More information is available at the PamLytics website.